There are many things that can interfere with PCB soldering process which can cause solder joint failure, but we can divide them into three main groups. One is oxidation, another is heat, and the third is perhaps the design or human error. Keep the following three points in mind, you can at least avoid some solder joint failure. Oxidation occurs naturally with chemical reactions between the metals involved in soldering and the air. Since oxygen can react with copper and lead, and then form an oxide layer which influences how solder flows. One of the main important parts of getting a good solder joint is to make sure that oxidation is not interfering. The second cause of failure in a solder joint is the insufficient heat. If the solder isn’t above its melting point, then parts of it will remain solid. Though it still can flow or be shaped into a soldered joint that looks like it may be okay, it really hasn’t had enough energy to go through this diffusion process where the two metals flow into one another at the interface. The third main cause of solder joint failure is human or design error. 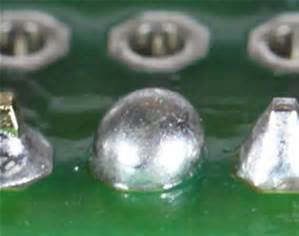 It’s common for many people to use solder as a mechanical connection between parts and in a way that may have some susceptibility to flexing. If the flex occurs, it can easily loose the joint between the copper and the solder and form a crack.